– The maples range of kennels is a popular choice for the Boarding Kennels industry, Dog Breeder and Domestic Customer alike. – It offers the ability to house several dogs or pairs of dogs in as many bays as you like. – The kennel blocks can be customised with insulation, coroline roofing, integral corridors and a range of further options. – 2 Galvanised Padbolts on the kennel doors. 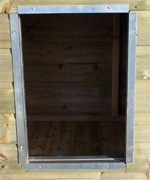 Each Bay has a 5ft x 4ft Kennel & a 5ft x 6ft 6 Run. The tanalised treatment described above gives wood the qualities of a long service life and long term protection from fungal and insect attack. Tanalised timber does not need any further maintenance or treatment. Saving you Money and Timeannually staining your kennel.